Have a REALLY BIG wedding party or group? Then, our luxury mini-coaches may be just what you need! 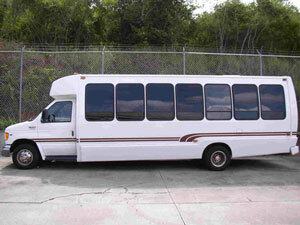 Our mini-coaches can adequately accommodate up to 25 passengers in comfortable, plush seating. Our mini-coaches are not only roomy and fully air-conditioned, but they also offer all your guests the opportunity to ride together in luxurious comfort and style!